How was your long weekend? Although we did take some time to enjoy ourselves, most of our time was spent finishing outdoor projects before it gets too cold. Since our basement renovation took longer than anticipated (you know big projects always do), I held off staining our front porch. With trades coming in and out over the past few months, our front door, spindles and porch floor saw their share of dings and marks. Now that we’re on to the furnishing and decorating phase of the basement (more on that later this week), I felt it was safe to give the porch a little TLC. See how the dark grey has faded over time and how dull everything looks. Not the best first impression I want to make! A good lesson to see what’s wrong with any space is to take a photo. I’ve always thought the light fixture looked small and it’s blatantly obvious in this photo (something to change out down the road). Not only did the porch take a beating with the renovation, but last winter took its toll on our evergreen shrubs in the front as well. We pulled them out in the spring and I’m going to replace them now that the staining is done. I’m thinking ornamental grasses and possibly a couple of hardy perennials will soften the look. The one thing I’m a little stumped on is what color to paint the front door. A few years ago I painted it a deep plum color to complement the large tree in our front yard. Although I’ve liked the color, it’s time for a freshening and a bit of a change. A black door is a look I never seem to grow tired of. This butter yellow door spotted on Real Simple is so refreshing! I’m drawn to the classic look of this espresso door paired with the grey siding and white trim. 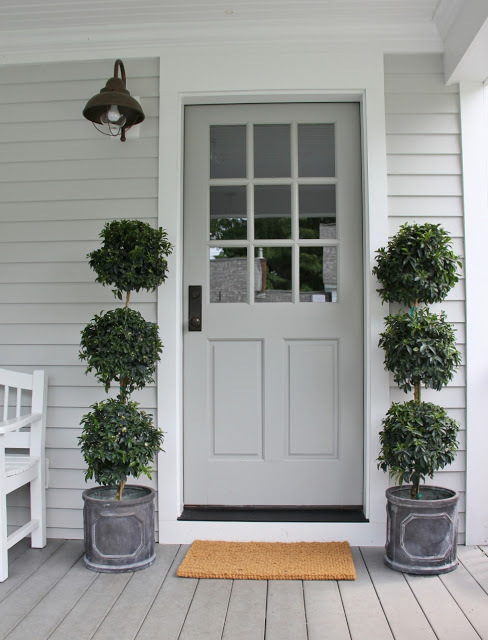 And, lastly, I’m smitten with this soft grey door by Henhurst Interiors. What do you think? Although I have a front runner in mind, I’d really like a second, third, fourth… opinion. 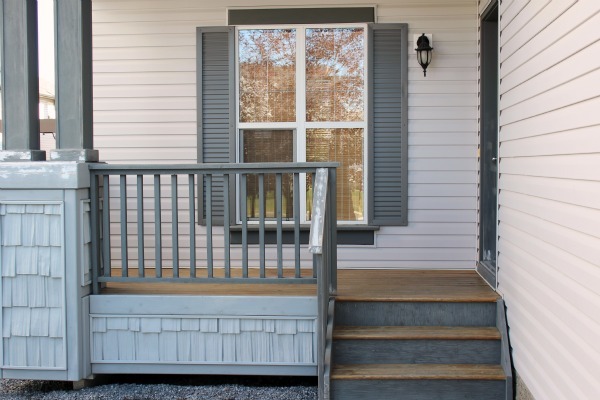 I’ll be posting our front porch reveal next week (if mother nature cooperates), so be sure to come back. 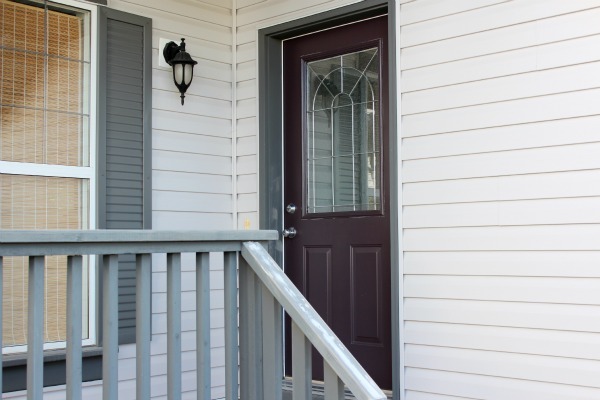 Update: Check out our newly painted front door and porch! « Do Trends Influence How You Decorate? I’m excited to see what color you choose! I’m with Samantha, I’m going to go with yellow, it will definitely give you a fresh look. Although any of your contenders are great colors. 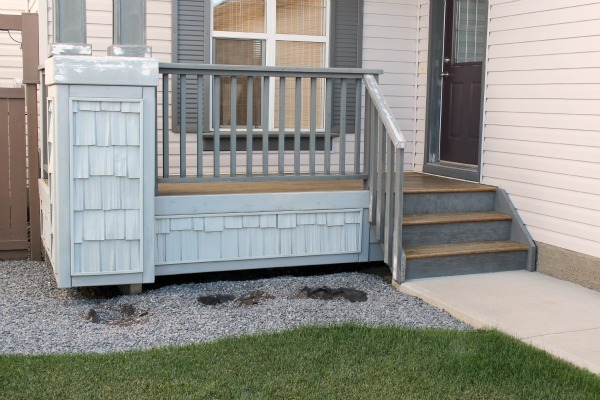 Good luck with your porch reveal! We put the light fixtures up over the weekend and installed the beverage fridge. Just have the backsplash to go, but I’ll do an update post before we do that. I’m just waiting for the sun to shine to take better photos. I promise I’ll show more by the end of the week :) Thanks for following along and all your comments! Hi Shauna, I Love the first photo with the Black, I think it looks sophisticated and elegant,having said that I agree with the other girls that you cannot go wrong with any of the other colors you chose. Black is always sophisticated and I think it goes well with everything. I know there are bigger things to think about in life, but this is a difficult decision! Thanks for your input. I love the second to last picture with the grey siding and dark coloured door! That would be what i would do if my neighbour’s house wasn’t exactly those colours! :( lol Look forward to seeing what you decided! PS – Found you via the blog group, so maybe we’ll meet up at one of the events sometime in the future! Love that look too- so hard to choose! It would be fantastic to meet up. Love the photos on your website! With grey siding, I like black. I painted my door red last year and I’m tired of it. Probably going back to dark grey or black. I like red, but I find it’s been overdone in my neck of the woods. Black is usually a safe bet, but the look can be elevated with decorative and seasonal elements. That’s the direction I’m leaning. Like you, I seem to grow tired of certain colors. I think a yellow or a deep red would look amazing with the grey color! Thanks for your input. I’m staying away from red because of the deep plum colored tree and shrubs in our yard and it seems like a lot of people in our area have gone with that color so I want something different. It may take some good convincing to get my family on board with the yellow!